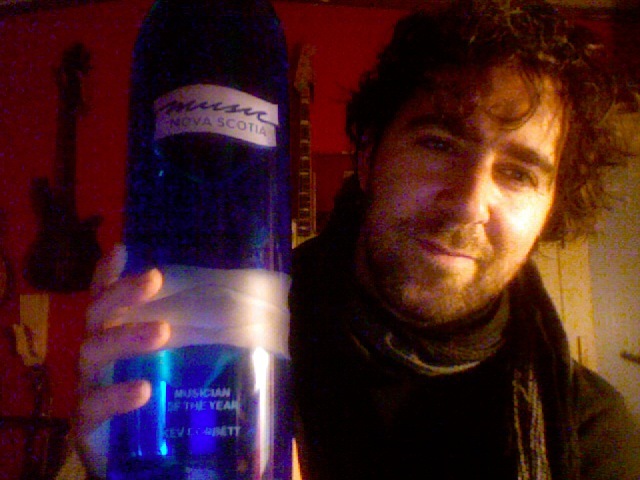 A quick little update: last weekend, at the Nova Scotia Music Week conference, I was awarded the Musician of the Year award. This award is voted on by people in the biz, and is about the jobbing player. I call it the Journeyman’s award, and having come into the biz with the goal of being the ultimate sideman, it is maybe the award I have the most respect for, as it’s not about who’s-cool-this-year or how big your team is, as much as it’s about being versatile, busy, giving every song its due. At least, it is to me. So, to Music Nova Scotia, thanks for all your hard work, it was a great conference. To the folks who voted, thanks for your confidence. I’ve worked for many of you and I hope to work for all of you before we die. To the folks who hire me, thanks for your trust. To my baby, thanks for everything. I’m insanely lucky, and very happy with life.